As all may know I am involved with the Valley Winds Music Association. I would like to invite you join me at this year’s fundraiser for this fantastic group. Join the Valley Winds Big Band and the Midnight Blue Jazz Band on Saturday November 1st for some fun in the Mountain Lady’s Haunted Greenhouse. Dress up, get into the Halloween Spirit and float around the room to the sounds of the Band. Tickets are $40 and include one drink, wine or beer. The month of March showed a slight slowdown in the number of properties sold from the previous month and even the previous month a year ago. 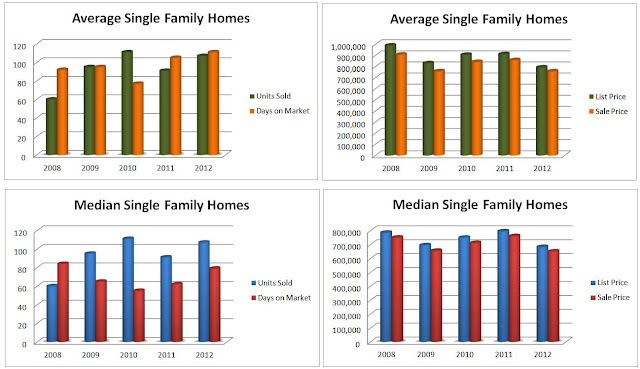 The big difference especially in the single family home market is the Days on the Market (DOM) for a property to sell. The following chart shows a median DOM for single family home sales of 27 days. However in this number there were 3 properties that were on the market for a very long time. Two were close to 300 days, and one was 588 days. When we remove these 3 sales, we have a DOM of 13 days. This is incredible. This means the remaining 9 homes that sold in March were priced to sell. They were priced correctly. As an agent it is always disappointing when you give sound honest advice when asked for an evaluation on a property and the advice is not heeded. The single family home that took 588 days to sell finally sold for $205,000 less than the original asking price. If this property had been priced correctly as I suggested back in 2011, I am convinced the seller would have gotten somewhere in the area of $150,000 more, a year and a half ago. It is often very hard to take a rational look at the true value of one’s real estate holdings. We live in these properties. We raise our families often in these homes. We sometimes custom build our homes. We entertain in our residences. All these factors influence our decisions, but the bottom line that I have stated for years (which really stands out this mast month) is you must PRICE YOUR PROPERTY CORRECTLY FOR THE CURRENT MARKET CONDITIONS. The late winter months and spring have always been excellent months to market your home for sale. With realistic expectations and a true desire to sell, now is the time. GIVE ME A CALL AND WE CAN TALK ABOUT THE MARKET IN MORE DETAIL. Wow!! 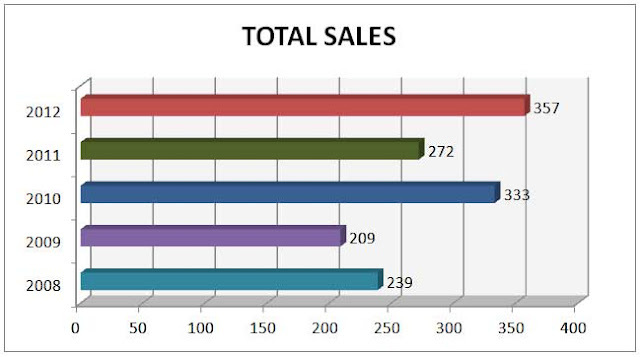 Look at the total number of sales this past month – February, to the same month last year. February 2013 we had 40 units sell, last year we had 23. Now let’s look at the single family stats. We can see quite a difference from last month (January) and also from February a year ago. The median sale price from last month is up by over $200,000 and the number of sales has more than doubled. Then same applies when we compare February 2013 to the same month a year ago. Also the days on the market have dropped by 25%. These are all indications that sellers are pricing their homes in line with market values and also buyers are ready to purchase. We also see very good activity in the non-single family sector of our market. The number of sales has almost doubled, days on the market have dropped to 14, and sale prices are in line with a year ago. There appears to be stability in this market, and as the inventory drops I would expect sellers to gradually be able to increase their asking prices. GIVE ME A CALL AT 403-678-1069 AND WE CAN TALK ABOUT THE MARKET IN MORE DETAIL. Although single family sale prices are slightly down from last month, we do see the number of days on the market have decreased significantly and the number of units sold have increased. Compared to a year ago, sale prices are also up. With the non-single family homes, we see quite a drop in the median sale price. The days on the market as well as the number of units sold are also down slightly. It will be interesting to watch this market going forward to see if this trend continues. This is a good time for both buyers and sellers to enter the market as it appears we are about as balanced as can be expected. What is a transitional market? How does it affect you as a buyer or as a seller? What’s happening in our Canmore market? People always say that real estate is a great investment because the value of homes is always going up. To some extent, there’s truth in that. But it’s also a fact that the real estate market fluctuates. Sometimes it’s a buyer’s market and sometimes it’s a seller’s market. And there are actually other times when the real estate market is in transition. A transitional real estate market poses certain issues for people who are buying and selling homes and you should be aware of them. This is especially true for anyone involved in real estate right now because the real estate market in many areas is either in transition or could be in transition shortly. A transitional real estate market happens during the interim between a buyer’s market and a seller’s market. There’s this funny period of time in which the market isn’t particularly good for either party. In a way, this gives each party some leverage in the real estate transaction. And yet it also puts them on solid ground. If you are buying or selling a home in a transitional real estate market, there are some things that you can do to help give you a leg up in the interaction. 1) You should know whether it’s going from a buyer’s market to a seller’s market or the reverse. Being aware of this helps you to position yourself and sell yourself appropriately. For example, if you are a buyer and real estate is transitioning to a buyer’s market, you can point out to the seller that he’s going to have a harder time selling in two months and therefore should make the sale to you at a good price. Likewise, if you realize that it’s a transitional real estate market that will soon be in your favor, you might make the decision to hold off on the transaction all together. 2) Understand ‘fair market value’. When you are buying or selling a home during a buyer’s market or seller’s market, the value of the home is based significantly on the supply and demand issue. When you are buying or selling a home in the transitional real estate market, the home’s sale price will be based more closely on the fair market value of the home. You should learn this concept inside and out and work with appraisers in your area to determine the FMV of the home you’re buying or selling. 3) Be aware that terms are more solid in a transitional real estate market. There’s going to be less negotiating during this time so you shouldn’t make false offers on either end hoping to manipulate the other party. Be more direct in your dealings during a transitional period. 4) Work with a professional who understands the transitional market. You’ll want realtors (and lenders if you’re buying) who understand the transitional real estate market which means that you’ll need to look for people who have been in the industry for a long time. 1. The total number of sales for 2012 is up by 85 properties, or just over 30% from 2011. 2. The average and median sale price for both single family and non single family sales was the lowest in 2012 as it has been in the past 5 years. 3. 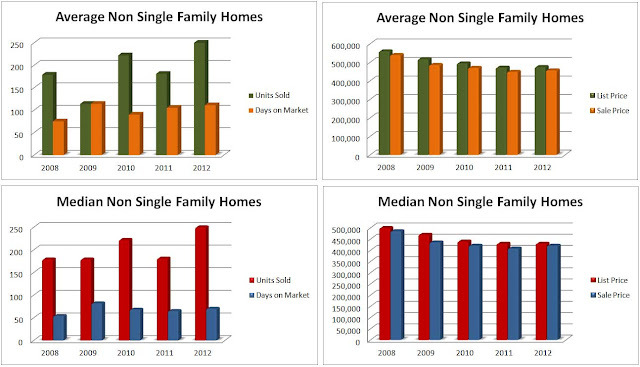 The number of non single family home sales for 2012 was up by 69 properties or almost 40% over the previous year. As we enter 2013 our total number of active listings is less than 250. This compared to close to 400 at the end of 2011 is a significant drop in our inventory. With fewer properties for sale sellers can expect the Days on Market for their properties to be lower, as well as sale prices to start to increase. The key however is still to ensure the property is priced “correctly” to catch the attention of a buyer. This past year saw 17 single family home sales over $1,000,000. However, compared to previous years there was not as many over the $2,000,000 sale price and so the brings down the average and median sale price. The hotel condominium market had a strong year for sales as sellers realized the need to be aggressive with their pricing. With strong competition from developers needing to sell off units we have seen sale prices down over 35% for the highs in the mid 2000’s. Moving forward it has been reported that Calgary expects close to 25,000 new residences to move into their city in 2013. With the oil and gas sector remaining a very large part of Alberta’s economy, I suggest we will also see more second home purchases in 2013. Don’t get caught thinking you can reduce your asking price after a few weeks. You need to be aggressive if you really want to sell! As a buyer, you need an agent that is a good negotiator. An agent that can provide the market history and defend your offering position when it is time to present your offer. GIVE ME A CALL OR DROP ME AN EMAIL. I HAVE THE EXPERIENCE!! DON’T WAIT TO LONG TO TAKE ADVANTAGE OF THIS BUYER’S MARKET!! If you would like to be kept up to date on the value of your Canmore investment, or just wanting to know what is happening in a particular area of town – just send me an email or give me a call. For a family friendly evening join the festivities of New Years Eve on the Pond in Canmore. Food, skating and fireworks. Sorry for the inconvenience as I build out my new website with new features and information. Real Estate listing and search information will be available and updated on a regular basis. As well I will be publishing local news and lifestyle items in this blog. Expect to see reports and useful information about the Canmore real estate market.